You need to have a clear cut plan about how to send your child to college and more importantly you need to plan and provide for the same. Here are five basic rules that will help you to plan and finance your child’s higher education. Your child is just three years old but you are already worried about how you will manage college funding for your child. If you are already worried, then you are on the right track. But worrying alone will not help. You need to have a clear cut plan about how to send your child to college and more importantly you need to plan and provide for the same. Here are five basic rules that will help you to plan and finance your child’s higher education. Your financial planning typically starts off with your goals in mind. At the very outset, make an estimate of when your child will go to college and plan backwards accordingly. A college education costs big money today. A quality graduation degree in India can set you back by Rs50 lakh and a post graduation qualification will cost you an equivalent amount. These are at current prices, so you need to first extrapolate how much the education will cost 12-15 years down the line. Once you arrive at a benchmark figure, work backwards. But, more importantly ensure that your child’s financial plan is made a key goal in your financial plan with clear financial commitments and milestones. It is clear that you have to take the equity funds route and invest in these funds. That way you can reach a corpus of Rs1 crore in 15 years by saving Rs17,693 per month in an equity fund that can conservatively generate 14% annualized returns. Make equities and time work in your favour. As is evident from the above table, the earlier you start, the lesser you are required to save to reach your eventual target of Rs1cr. The key is to make time work in your favour. The entire SIP idea is good if you start early and invest through equities. You are likely to comfortably provide for your child’s college education. But what if, God forbid, something was to happen to you. You must build insurance into the plan in such a way that the child’s education plan is not impacted. There are two ways to do it. There are children plan funds that will automatically build insurance into your plan. Alternatively, you can have a term policy for an equivalent amount so that in any eventuality the term insurance corpus will pay for the SIP required to send your child to college. Creating the plan and leaving it on auto mode is not enough. You need to review the child plan at least once a year to ensure that it is on target. Have college costs gone up more than anticipated? Is your investment accumulation on track to achieve the goal? How to intersperse an additional child plan for your second child? 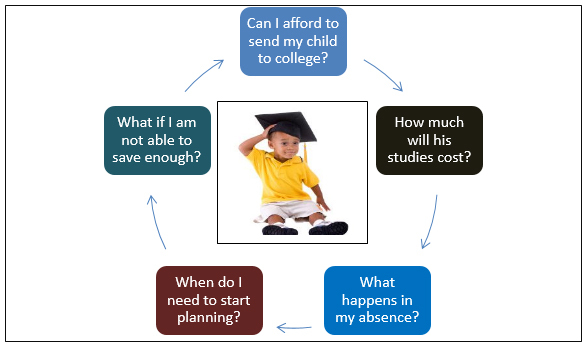 These are some of the questions you need to answer through constant monitoring and review of the child plan.